Go Army! Buy your Army football tickets from TicketGalaxy.com the Proud Partner of Army West Point Athletics. Go Army! The United States Military Academy has one of the most well-known NCAA Division I football teams in the United States, the Army Black Knights. The Army Black Knights most known game of the year is the Army-Navy Game. It is one of the oldest rivalries in all of NCAA Division I football. The first game between the two teams dates back to November 29, 1890. To this day, Navy’s football team is currently leading the Army-Navy game 60-50-7. Buy your tickets to see the Army football from TicketGalaxy.com the Proud Partner of Army West Point Athletics. Head to the official Army West Point Black Knights Football page for more information. Purchase your Army football tickets at Ticket Galaxy! Choose your event date and click "Find Tickets" to bring you to our array of seating options. Select your tickets on the maps page by clicking the price box. From there, TicketGalaxy.com will bring you to our checkout. Get your Army football tickets quickly and easily today! 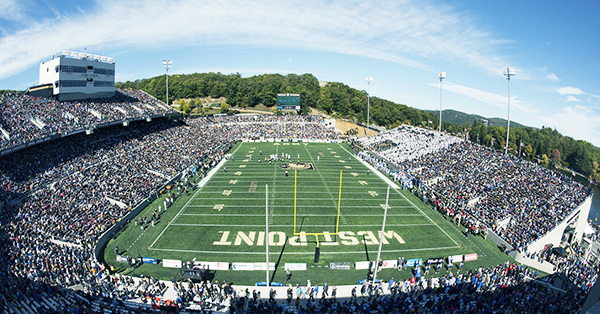 Ticket Galaxy is the Proud Partner of Army West Point Athletics.